Another winner for the warm weather! 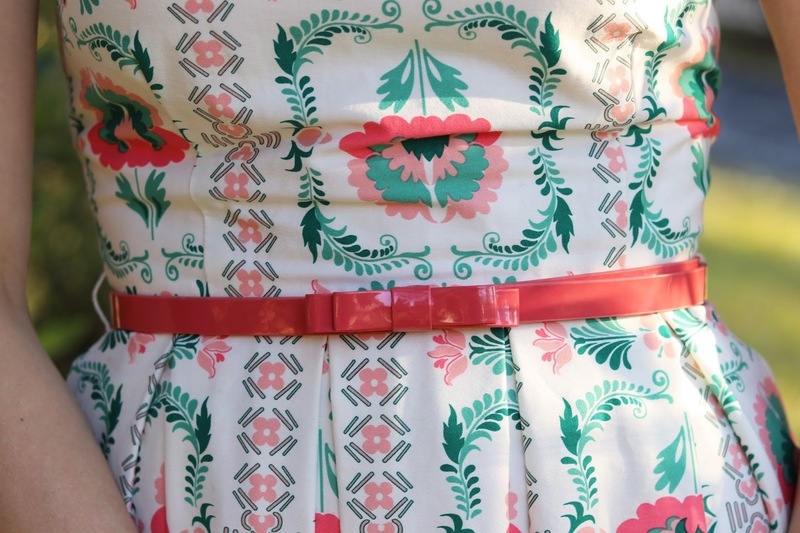 Ellis Mirrored Tile Print Dress w/ Belt - c/o Joanie Clothing (On sale)! 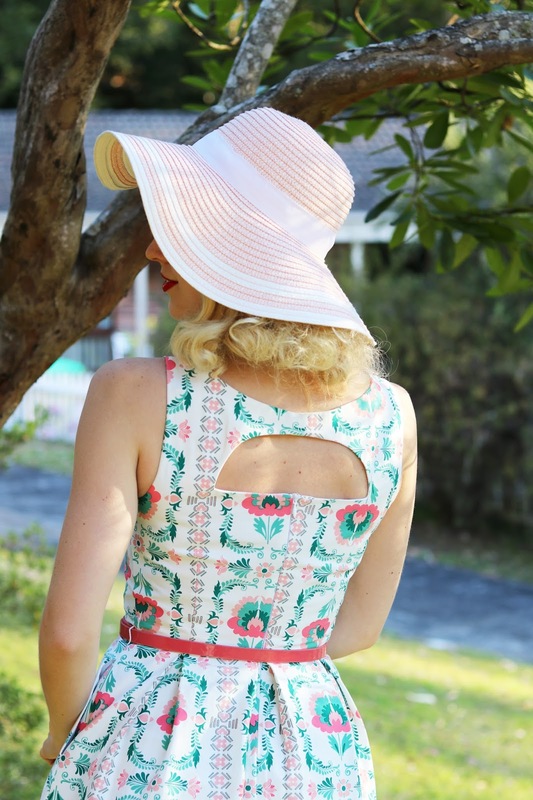 I wore this dress a few weeks ago, I was first drawn to the gorgeous pastel tile print and the cut out back as I can't resist great details like these. 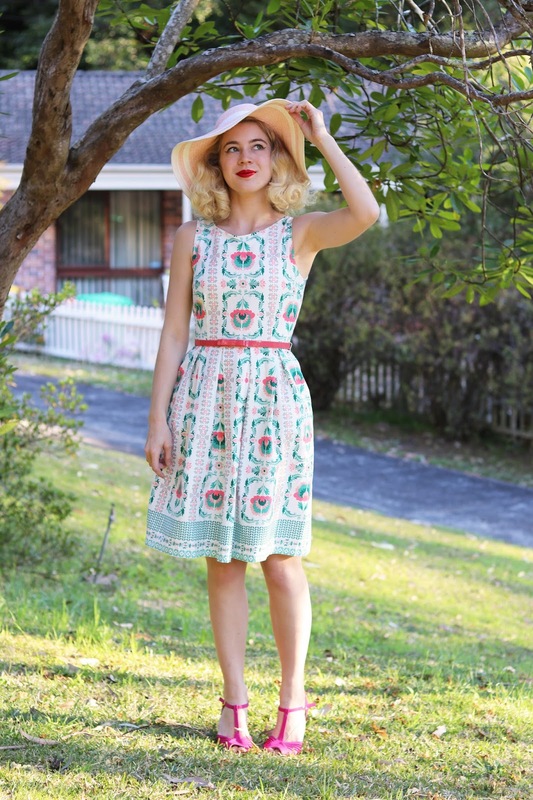 This dress is perfect for the warm weather and such an easy style to chuck on with a hat and a cute pair of shoes. To enhance the pink tones of this dress I went with pinks heels and a hat which also matches with the belt quite well. With a print this pretty and detailed I didn't feel the need for any accessories as it looks so nice as it is! I went with size 8 as I have with the last few Joanie pieces that I have tried, although this is a great fit I did find the bust to be a little snug so if you are concerned about that I would recommend sizing up for this style, other than that the waist was a great fit and general fit of the dress was great - Oh and it has pockets too! This cotton dress is very much breathable for hot summer days and I love the cute bow belt that comes with it. Joanie Clothing always have so many pretty new arrivals and I always see something cute I like. This week has been super busy and it will continue, I have a busy Saturday shooting some things for a blog post next week, hopefully I can get some sewing in too as I'm so excited about what I have been working on but I keep running out of time to continue with it. I think I'm going to get ready for bed soon, I'm ready to crash! But first I'll have a cup of tea... Are you up to anything fun this weekend? I do love Joanie's dresses! Young, fresh and playful. And this dress delivers spectacularly.